When William Forsyth brought forsythia from the far east to western gardens, I wonder if he had any idea that the precious cuttings transported in Wardian cases would spread so far and wide. It’s now a ubiquitous landscape shrub that graces our gardens, highways, parks and vacant lots - a brave harbinger of a new season. Forsythia spilling over an embankment. 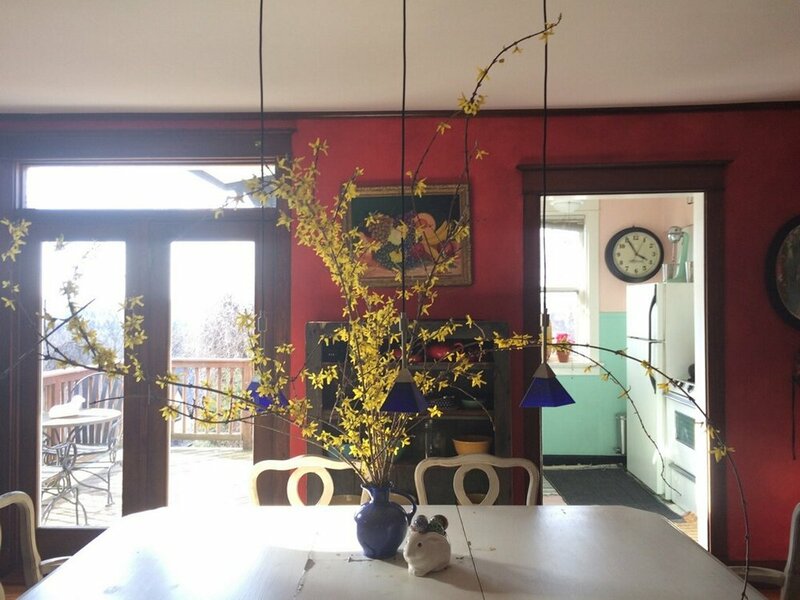 It’s April, and the canary yellow forsythia is blooming everywhere. In our Western Pennsylvania gardens, the flowers rarely get to age gracefully. As soon as they reach maturity - zap! There's a freeze or a heat wave and they become coal mine canaries. Forsythia is sited and cared for in our gardens in a variety of different ways. The most sustainable use is to be sited at a visual distance and with lots of space, where it can be allowed to take its natural shape : large and loosely arching. It will also sucker and spread as it forms new canes .The bright color is sometimes seen nicely balanced, visually against robust evergreens; or seen rather ethereally against winter browns. At a distance, morning atmosphere quiets the yellow. Forsythia can be seen spilling over embankments or tumbling down a hillside. Forsythia balancing yellow against robust evergreens. Brought close to our dwellings where space is limited the inclination to make it smaller results in a variety of configurations. It becomes a high maintenance pruning task requiring a degree of skill to balance both thinning and heading cuts. Timing matters since it blooms on old wood. Frequently, it's just made smaller with cuts that result in clumsy shapes like severed totems . Obviously, my preference is to let it run wild and free. The only time I would cut it, is to bring some branches inside on a late February day. The buds are just beginning to swell and I can watch spring slowly unfold in the warmth of my living room. But Forcing Spring Flowering Branches is the subject for another blog. As a designer, I almost never specify the common Forsythia varieties, though I'm sometimes tempted to use the paler yellow or white ones. There are better and more sustainable choices both for hedging and early spring color. 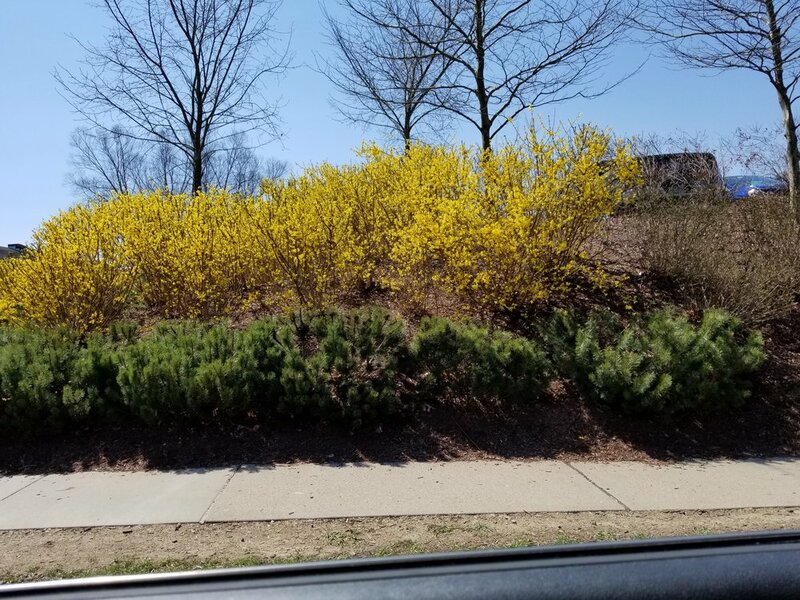 After its 3 week debut, forsythia becomes an ordinary shrub for the summer and offers no fall or winter interest. So of course, they can stay.